I think I have become a runner…. Yesterday, I went out for an 8 mile run at 10:30 in the morning. It was pretty cloudy and cold, just the way I like it for running outside. I looked at the weather and saw that we were expecting rain, but I thought I would have enough time before it started. I was wrong. Just as I was going into my last mile it started to sprinkle and soon it was raining pretty hard. Instead of stopping and find a place to wait it out. I kept going. Invigorated by this surreal moment, I smiled and kept going. 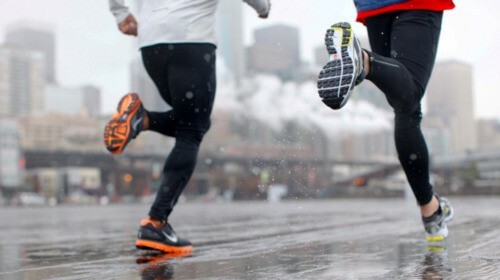 I thought about all the times I had passed people running in the rain and thought they were crazy. I thought about the times I had used rain as an excuse not to work out. I thought about insane I probably looked smiling and running. That was my favorite run so far in my training…. …I have become a runner. I describe myself as many things, teacher, artist, sister, friend, coffeelover, booknerd, tv addict, but never have I used the term runner to describe myself. It is a surreal thing for me, as someone who hated running a year and half ago, as someone who hated PE in school, and stood in the middle of the field while playing ultimate frisbee, and always vetoed the suggested of physical exercise as an option to do with friends. So when someone suggests that people can’t change, I tell them my story about what I once was and what I am now. I am now a runner. What are you? What do you want to become? Is there something you think you will never be? What do you see as impossible in your life? An Update on my life!